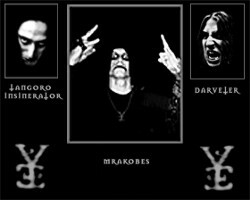 Tangorodrim are an underground alcoholic black metal band from Israel (aiming to seperate themselves from the scene and remain relatively obscure) compiled of three Russian immigrants, Mrakobes (vocals/guitar), Tangor (guitar), Darveter (bass), and Alcogolik (drums). They play raw and intense black metal in the vein of oldschool bands such as Hellhammer, Darkthrone and Mayhem. The band released their first couple of records Unholy Metal Way and Those Who Unleashed on their own Agressor records. 2004 saw the release of their third vinyl-only release, Unholy and Unlimited on Southern Lord records.